Twelve plates from the famous ‘Marly Rouge‘ dessert service made at the Sèvres porcelain factory for the Emperor Napoleon in 1809, and delivered to the Château of Fontainebleau, sold for £81,250 at Bonhams Fine European Ceramics Sale in London on Thursday 5 July. The 12 plates were estimated at £70,000-90,000. 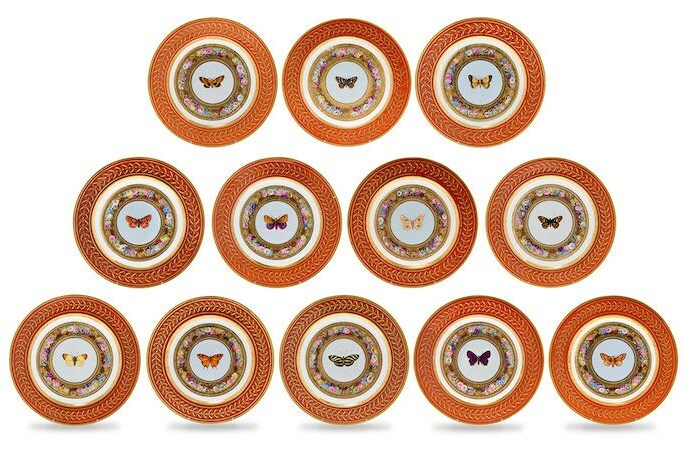 The hand-painted plates in red and gold sport the motif of a butterfly – each image is subtly different – and were among the 180 plates which made up the major part of the more than 250-piece service. Originally destined for Compiègne, they were delivered to Fontainbleau in October 1809 shortly before Napoleon arrived there to rest after the gruelling peace negotiations in Vienna with Austria and its Allies that resulted in the Treaty of Schönbrunn. It was also during this visit to Fontainbleau that the Emperor told his wife Josephine that he was divorcing her because she had been unable to bear him a son and heir. Napoleon took the ‘Marly Rouge‘ service with him into exile on Elba in 1814, and at some stage after that, most – if not all of it – were passed to his youngest brother Jérôme. He, in turn, gave them as a wedding present to his son – also Jérôme – and his American wife. Since then, the service has been owned by, among others, Charles Joseph Bonaparte, who served as United States Secretary of the Navy (1905) and Attorney General in the cabinet of President Theodore Roosevelt (1906-09). During this time, he founded the forerunner of the FBI. It is believed that the service was split up sometime in the 1920s.